A battery powered security camera is a totally 100% wire free camera (from top to bottom). No cords and no wiring — all that frees you from hassles. Below are the reasons why you should choose a battery-powered WiFi security camera. Note: Nowadays, not all wireless security cameras are truly wire-free. Be smart when buying your own battery powered wire-free security cameras. The task of choosing between wired and wireless security systems may seem confusing at first, but thanks to emerging technology, the argument for using battery-operated security cameras is growing stronger by the day. A battery operated security camera is affordable. The price is around $100. The more features it comes with, the higher price it would be. Moreover, all most all battery powered security cameras are easy to install and set up. You can install the cameras yourself, and there’s no need to hire a team of professionals to make a call-out to carry out the work. Security companies generally add their own margin onto to the original cost of their camera hardware. 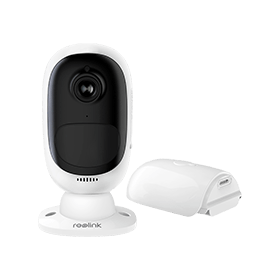 Battery-operated security cameras offer audio and video quality which is often of a much higher caliber than their wired counterparts, especially for the given price. That means grainy video quality is largely a thing of the past. In the same way that phones have developed increasingly powerful cameras, the battery-operated versions are steadily overtaking wireless cameras in this particular area. In short, for shop, business, vehicle or home use, this means identifying criminals has become much more convenient and cheaper than ever before. One of the greatest security threats to homeowners is the possibility of the camera or security system’s wires being cut. Particularly if cameras have been recently moved to monitor suspicious activity, this risk is minimal. There are no cords and no wiring hassle with battery powered security cameras! You don’t have to consider if you need to drill holes into your walls, and how to put the wires through your home. No matter which part of the home, vehicle or outdoor area, needs monitoring, battery-operated cameras are easily moved and capable of surveiling that region in virtually no time at all. Again, this capability comes without the hassle of hiring security professionals to re-install them each time. Whether you’re concerned about the safety of your child, your pets, your electronic equipment, or your vehicle, you’re always in a position to move the cameras to the desired risk-area. Battery powered security cameras will allow you to monitor your home from anywhere in the world using your phone or computer. The installation of mobile apps for surveillance is very simple and doesn’t input from a security company. Moreover, battery-operated cameras are now able to alert you to unusual activity, sending you push notifications or emails. You will know in real time what is happening in your home. But this advantage doesn’t only apply to long distance surveillance. Where the elderly and young children are at risk, a battery-operated camera can allow you to check on their health at a glance, and without the need to move from your desk while you’re at work or get out of bed in the early hours of the morning. Not only is your phone or laptop portable, but the cameras themselves can be moved from place to place without much effort. If you’re renting your home or simply move frequently for any number of reasons, this can be exceptionally useful. You’ll be able to maintain your surveillance capabilities wherever you go without the requirement of investing in a wired surveillance system on each occasion. What’s more, you can install it anywhere outside, especially where there are no power outlets but you need video surveillance (see How to Choose a Suitable Battery Powered Wire-Free Outdoor Camera). Whether you’re using only one battery-operated camera or a series of them, new surveillance systems on the market mean you can slowly build up your home’s surveillance protection without a large initial capital outlay. The battery powered security cameras can work with other devices, not only with a computer or a smartphone, but also with a NVR (network video recorder), a PIR sensor, a door sensor, or a window sensor. They act as a whole security camera system for a full protection. Modern battery-operated cameras are also easily integrated with each other by communicating with each other in such a way that they’ll alert you to any unusual activity in your home (or elsewhere). The advantage here is quite obvious. Even during electrical outages or in situations where your wired security cameras have been compromised, you’ll still be able to keep track of suspicious activity with using battery-operated security cameras. Many of you are surprised by the extensive array of battery-operated camera applications already in existence. There’s a far greater range of hi-tech functionality in these types of cameras than ever before. Battery-operated security cameras are becoming smaller and less conspicuous with each passing year, and their battery life is being extended too. In time they may become less susceptible to radio interference and replace wired security cameras completely. In the meantime, phone apps and increasing internet speeds will ensure that your existing battery-operated security camera isn’t likely to become obsolete any time soon. This entry was posted in Home Security FAQs and tagged advantages, battery security camera, benefits, wire-free cameras.